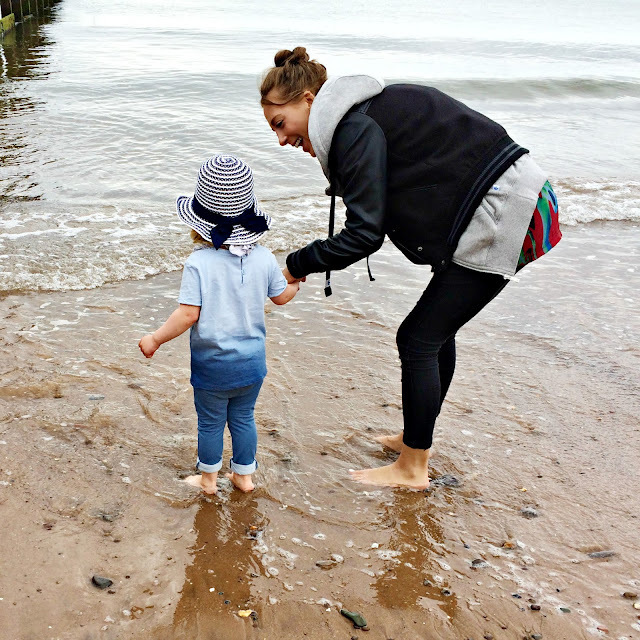 We were lucky enough to spend some time last May with friends in Devon. It's definitely one of our happy places and has been our main holiday destination for the last few years. We spent a particularly lovely day with my Mum and sister at Dawlish Warren - a day of paddling in the sea, sand castle building, shell collecting and fish and chip eating! This day sticks out in my mind as one of those extra special days, the memories you want to hold on to forever. 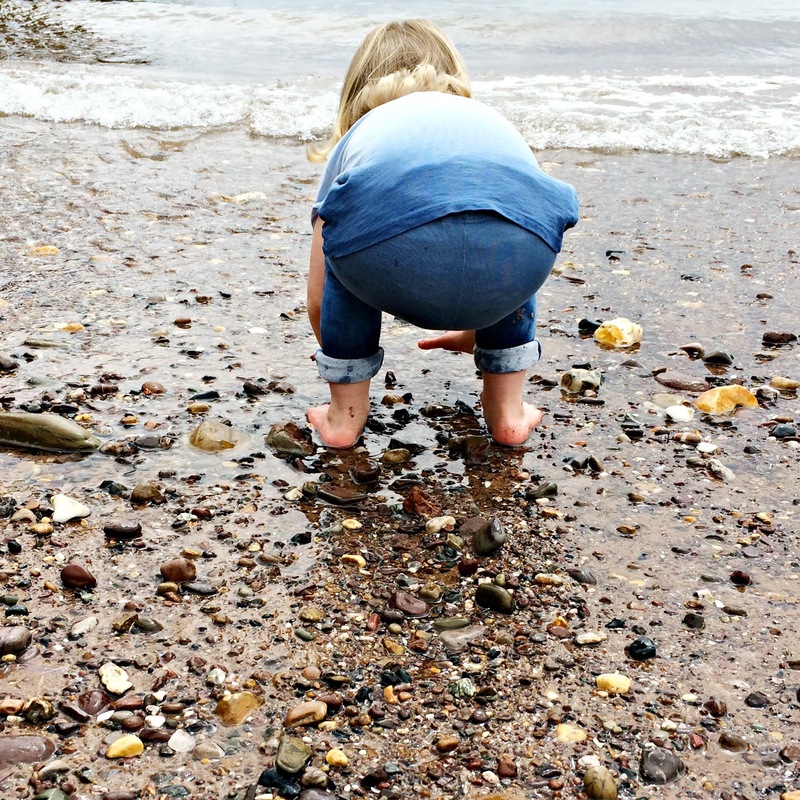 Lily wanted to keep all the little shells she found with Nana and Aunty 'Ouisey on the beach and so we ended up bringing home a little bucketful. For weeks they sat in the bucket by the back door with the other beach things, waiting to be put away properly. Until I realised that there was a much better way to treasure our mementos of the day. 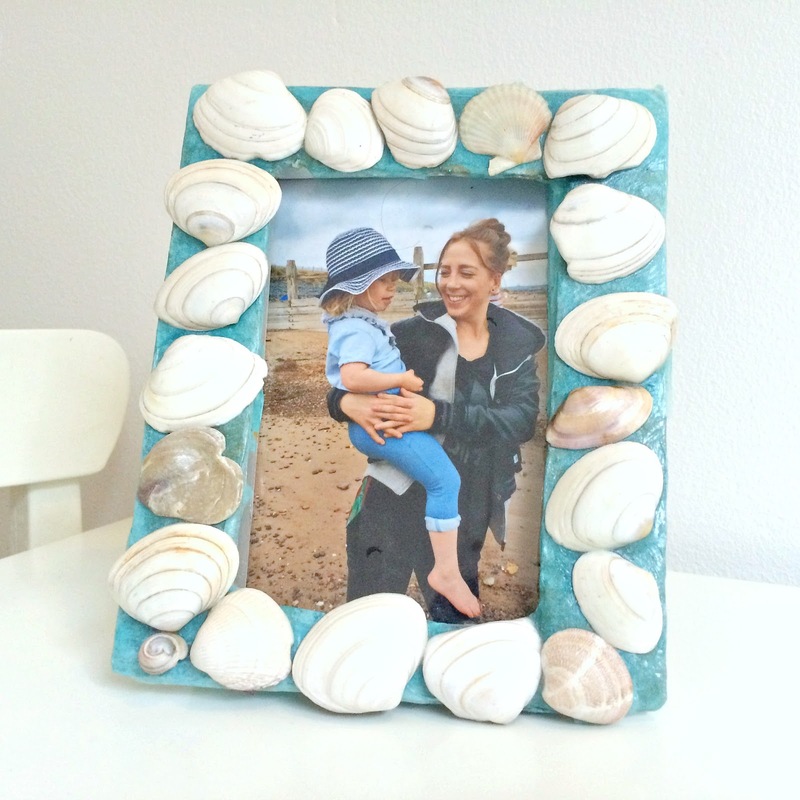 Using a cheap old photo frame, some tissue paper and mod podge glue, Lily was able to create her own shell photo frame. We first covered the frame with glued strips of blue tissue paper - this was to cover the silver frame and give us a better surface for sticking the shells on to. We used loads of glue for the shells and once dry I gave them another coat of glue to help them stay stuck! The glue dries clear like varnish so you can't see it, but it has certainly made the frame more robust - Lily often carries it around with her and I'm always finding it has moved. 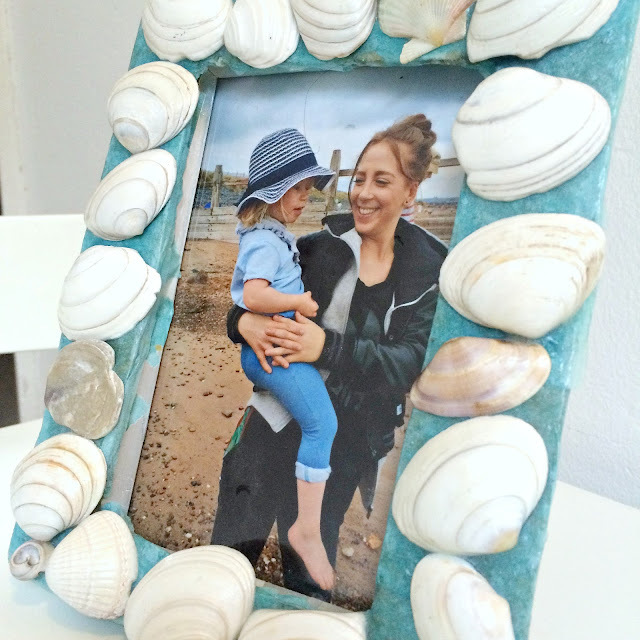 Lily loves her frame and I'm already thinking that we might do another one the next time we go to the beach. In my head I see a collection of photo frames, each displaying a different photo of an amazing day. 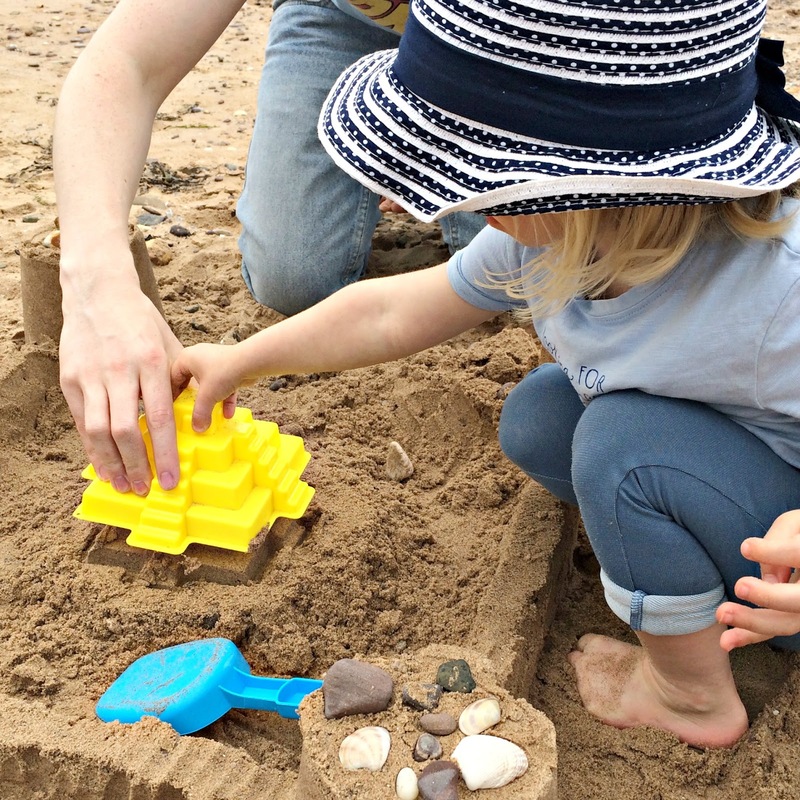 Have you got any tips for making beach keepsakes? Share them with me in the comments! Love these sort of things, they are such a lovely way to remember great days out and wonderful memories. Your frame looks fab. Collecting shells on the beach is always a big favourite in our house too. Thank you for joining me, I love this photo frame idea and such a lovely holiday you had to remember too. Love this. It makes everything so special for those all important memories.